Google Translate recently updated its iOS and Android applications, bringing Japanese-to-English and English-to-Japanese translation support to its augmented reality "Word Lens" feature. 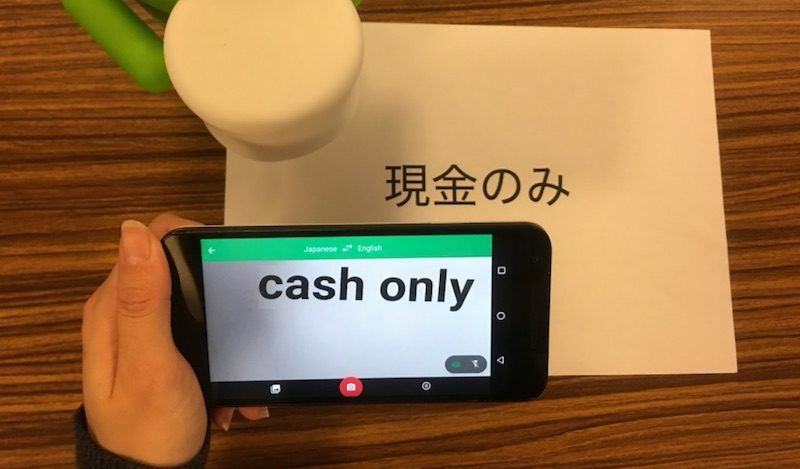 Thanks to the added support, English-speaking users can point their smartphone camera at Japanese text and instantly get an English translation on screen. The same can be done for Japanese tourists visiting predominantly English-speaking countries. Before the update, Google mentioned that users could snap a picture of Japanese text and get an English translation, but thanks to the AR in Word Lens, "it's a whole lot more convenient" to figure out where you are in a foreign city with the live translation feature. Notably, users don't have to worry about having an Internet or data connection when using Word Lens during travel, as the translation software works offline. The Google Translate app already lets you snap a photo of Japanese text and get a translation for it in English. But it’s a whole lot more convenient if you can just point your camera and instantly translate text on the go. With Word Lens, you just need to fire up the Translate app, point your camera at the Japanese text, and the English translations will appear overlaid on your screen—even if you don't have an Internet or data connection. It’s every savvy traveller’s dream! Back in November Google announced an update to Google Translate that made longer articles and paragraphs "a lot smoother and easier to read." Using new AI learning software called Neural Machine Translation, Google Translate can now learn over time "to create better, more natural translations." Google Translate is available to download for free from the App Store [Direct Link]. Google, a truly innovative company that helps bring the world closer together. This app is also free by the way. Meanwhile, apple is on the penny squeezing dongle plan. Free? So is the far superior Microsoft Translator... but who's counting? Microsoft Translator (https://itunes.apple.com/us/app/microsoft-translator/id1018949559?mt=8) app, which is also free, can image translate Japanese and many other languages also (and also offline capability). And I frankly much prefer its interface over "material" interface that Google is shoving to iOS users. So if the languages you want is on both, you should try both and see which you prefer.